The strangest trio ever to track a killer. A pure western in which a lawmen tracks a criminal, True Grit, based on Charles Portis' novel, reunited John Wayne with director Henry Hathaway (The Sons Of Katie Elder). Wayne is crotchety U.S. Marshal Rooster Cogburn, who would rather stay home than chase criminals. He heeds the call, though, when fourteen year-old Mattie Ross (Kim Darby) calls on him to avenge her father's death at the hands of a man who has escaped into Indian territory. Glen Campbell is a Texas ranger who accompanies them for his own reasons. Wayne reprised the role six years later in Rooster Cogburn. No use in pretending - I openly admit that I've never been much of a fan of Westerns. I was born just a little too late to embrace them during their heyday, and though they've experienced periodic revivals - most notably during the early Nineties, when Westerns grabbed Best Picture Oscars two of three years - I haven't been able to develop much of an affection for them. Nonetheless, I've seen a few I like - the classic Stagecoach impressed me most - and I'm happy to check out more of them to learn more about the genre. As such, I was pleased to receive a DVD copy of a "later-career" John Wayne piece, 1969's True Grit. Wayne continues to remain the definitive American icon, and it's exciting to witness more of his work. However, while Stagecoach impressed me mightily, this much-later efforts seemed less compelling. I believe much of Grit's fame comes from the fact it was the only film for which Wayne won a Best Actor Oscar. If ever an Academy Award was distributed based on a whole career's work, this was the one. Based on my admittedly weak knowledge of his career, I'd have to say that Wayne wasn't much of an actor. He developed an incredibly strong screen persona that carried him for years, but his acting talents seemed average at best. Grit certainly didn't tax his skills; there's nothing out of the ordinary asked of him in his role as Rooster Cogburn, and his victory in 1969 stands out as rather ridiculous. I don't want to sound too harsh, because I have nothing against Wayne, and I do like it when solid professionals such as he are honored. However, that's why they have honorary awards. Wayne is perfectly adequate in Grit but he certainly didn't deserve an Oscar for it. Nothing else about the movie merited any kind of prizes either. I thought that True Grit seemed like a stereotypical Western and rarely rose above those origins; nothing about it stood out to me in a positive way. The story is basic "chase the bad guy" with little room for character development or introspection, and the action that ensues falls flat; there aren't any rugged thrills to elevate the film. The most fun I had during Grit was seeing Robert Duvall and Dennis Hopper in some fairly early roles. Boy, it's amazing to think Hopper did Grit in the same year he made Easy Rider! Somehow I don't think Wayne would have cared for the latter film. Both Hopper and Duvall are perfectly fine in their parts, though most of my enjoyment just came from the recognition value. Probably my least favorite aspects of Grit come from the weak performances by Kim Darby and Glen Campbell. Actually, I shouldn't call Darby's work as revenge-minded Mattie Ross "poor", because I don't think she acts badly in the part. However, she really got on my nerves. The character is an obnoxious little priss who gets stuck with the script's worst lines; she's the one who has to incessantly spout off about how Cogburn has "grit - true grit!" I hate films that telegraph their titles, and Grit offends egregiously in that regard. Campbell was a hotshot singing star at the time, though for the life of me, I can't understand why anyone took to his hokey tunes. I guess that popularity earned him his role as Texas Ranger La Boeuf. (I kept hoping someone would ask, "Where's La Boeuf?") I suppose I should be happy that the film never takes time out to feature a song from Campbell - unlike the otherwise-excellent Guns of Navarone, which squeezes in a tune from James Darren - but I still disliked Campbell's work anyway. As with Darby, Campbell gets stuck with more than his fair share of silly dialogue, and he has even more trouble making it work. Campbell seems too inconsequential for me to believe him as a mildly tough lawman; the whole flashy "Rhinestone Cowboy" gig was more his style. I can't honestly say that I disliked True Grit, for it's a competently made film. However, I didn't think much of it; it seemed to be a pretty generic Western that never did anything to endear itself to me. I thought it offered a mildly interesting experience but not anything special. 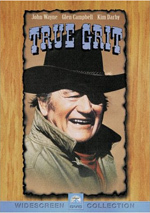 True Grit appears in its original theatrical aspect ratio of approximately 1.85:1 on this single-sided, single-layered DVD; the image has been enhanced for 16X9 televisions. True Grit presented a generally solid transfer that suffered from some avoidable problems. Sharpness usually looked quite good. Grit demonstrated some minor softness at times but those instances occurred infrequently. Most of Grit seemed very clear and crisp. Moir� effects and jagged edges created no concerns, but I did see some light edge haloes. Grit lost most of its points due to the quality of the print. Speckling occurred throughout the film and created distractions. At times the movie did look truly gritty. Colors seemed accurate and rich, though they displayed some of moderate heaviness that often seemed typical of the period. Black levels were also good, and shadow detail appeared satisfyingly heavy without becoming impenetrable. The sole exception occurred near the end of the film when "day for night" photography was used. Lose the source flaws and this would be a very nice presentation. As it stood, I thought the movie was too dirty to merit a grade above a �B-�. I found the monaural sound of True Grit to seem acceptable for the era in which the film was made. Though dialogue tended to be thin and without much fullness, the lines remained concise and easily intelligible. Music also suffered from lackluster definition. Treble dominated and little low-end material could be heard. Similar tendencies affected the effects, which were clear but not particularly lively. The emphasis on high-end information left this as a clean track that needed more dimensionality to prosper. Don�t expect much in the way of supplements. We find the trailer for Grit and nothing else. True Grit provides a fairly ordinary Western experience from John Wayne's final years as an actor. It offered only a mildly entertaining adventure. The DVD presented decent picture and audio plus virtually no extras. Leave this one to diehard fans of the Duke.